A Delicious Giant Chocolate Chip Cookie, freshly baked and hand decorated with royal icing and the Kansas City Chiefs logo. The party can begin when this Giant Kansas City Chiefs Cookie Cake arrives! Our Cheifs Cookie Cake is filled with a generous supply of chocolate chips, decorated with the Cheifs logo and bordered with colorful frosting. This product is freshly baked and does not include nuts. Our Cookie Cake is a 2 lb cookie which is the equivalent to 32 one oz cookies - enough for everybody to enjoy during the game. The Kansas City Chiefs Cookies will score a home run with your #1 Kansas City Chiefs fan. 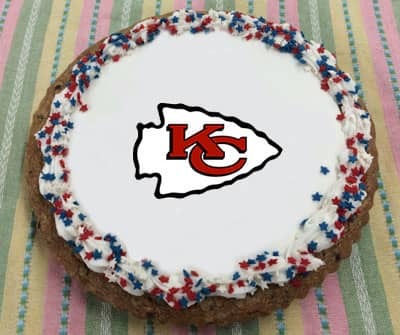 Not only are the Kansas City Chiefs Cookies a favorite treat to many, it shows your Kansas City Chiefs team spirit as they sit on your table at your party!